Germany did until the early 20th Century enjoy a wine reputation that rivalled both that of Italy and France, both for consistency and for quality. Military defeat and economic crisis throughout large parts of the 20th century put paid to that. Germany in the second half of the century was a laughing stock on the world wine stage. It is important to remember here that this situation reflected the wider European and world political system at the time. Wine is a matter of national pride for the French and Italians, and one way to reassert themselves following World War Two was to assert their dominance of the wine market. A weakened German wine market was a bonus in this respect. Germany, in her position, had little to bargain with: in order to reassert herself she took an industrial path: Germany became known for top end motors rather than fine wines. We must also consider the impact that the division of Germany had on the stability of the country in general. Germany, between the end of World War Two and 1990 was at the forefront of an ideological war fought between Capitalism and Communism. Apart from the economic and social strain that this put on Germany, it also restricted internal sales of home wine, meaning that whilst exports had fallen to France and the New World, home sales had effectively been crippled by Soviet occupation of Eastern Germany. Despite all of this Germany (which has a history of winemaking dating back to 100 B.C) is enjoying something of a revived interest throughout the world. In Britain this means that German Wine is not always synonymous in the mind with ‘Liebfraumilch’, a basic white wine. Interestingly, Liebfraumilch is not drunk in Germany, and is intended solely for export. The idea that Liebfraumilch represents German wine making may soon be consigned to history along with other outdated stereotypes about the Germans! In recent years people have warmed to German Wine again. This is partly due, oddly, to the effect that New World wine has had on people’s perceptions. The emergence of quality wines from countries not normally associated with good wine has blown the market wide open, allowing for a re-emergence of German products. The high quality of wine produced on the oldest estates, together with Good German Wine for most people means one thing: Riesling. Riesling is by far the most commonly produced German Wine. It is dry with a sometimes sharp taste and a smoky aftertaste. This is grown throughout Germany. Muller-Thugau is another commonly used grape, with a less prominent taste than Riesling, also grown widely throughout Germany. Gerwutztraminer is a spicy white grown in smaller quantities than the former, and again grown throughout Germany. These along with other grapes are hardy and can thrive in the cool Central European climate. Due to the relative stability of the German climate wines do not vary by area as much as in neighbouring France, where local terroir is everything. The German Wine classification system is notoriously difficult to comprehend and is operated according to sweetness/dryness and quality. Very good quality wines are simply identified by the specific Vineyard that they come from. Very broadly there are four categories (in ascendant order of quality): Deutscher Tafelwein; Deutscher Landwein (Country Wine); Qualitätswein bestimmter Anbaugebiete (close to the French Appelation d’Origine Controlee); Prädikatswein (the highest quality of wines). Germans are not known for their cuisine, although, in fairness, long lunches enjoyed with wine are a concept that extends throughout Europe. The German Tafelwein is an easy drinking wine enjoyed freely with meals as a matter of tradition. 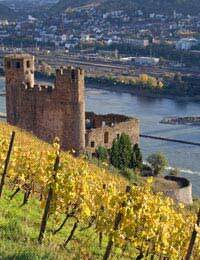 German wines tend to be light and therefore go down well with many of their meat based dishes. Germans like a lot of ‘spice’, which is ideally suited to Gerwutztraminer.